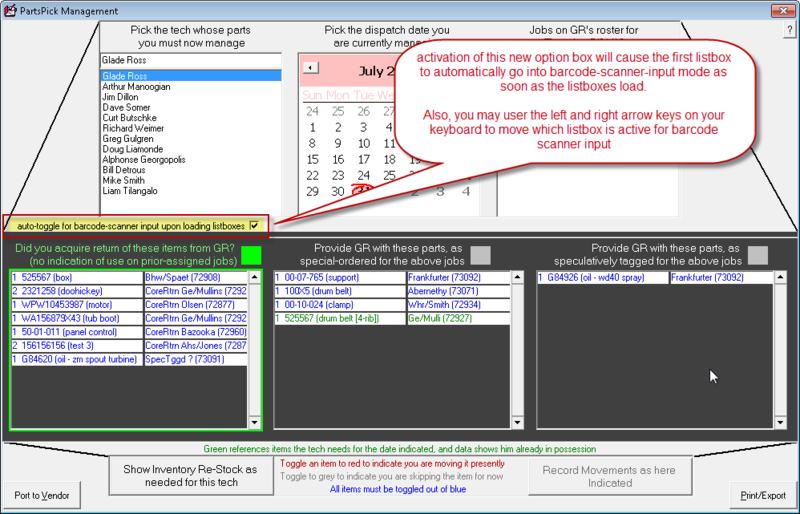 New Features: Immediate improvements on new "Barcode-Enabled PartsPick" functionality, , and more! With the last release, we introduced a big new feature that allows you to zap with a barcode scanner (instead of clicking with your mouse) to signify, in the PartsPick form, that items are being moved to or from a tech. Almost immediately, we realized the need for a couple of improvements. We'd prior failed to consider you might have multiple instances of the same part number within a single list. We've now added program code to cope with that. Now, if the system sees there are multiples of the "zapped" part number that have not yet been checked off, it will present a dialog that asks you to indicate which of the particular instances is actually being moved. Also, you may now use the left and right arrow keys on your keyboard to move -- leftward or rightward -- which of the lists is activated for scanner input.